The Air Jordan XIV has a habit of splitting opinions, much like some other Jordans of the era. 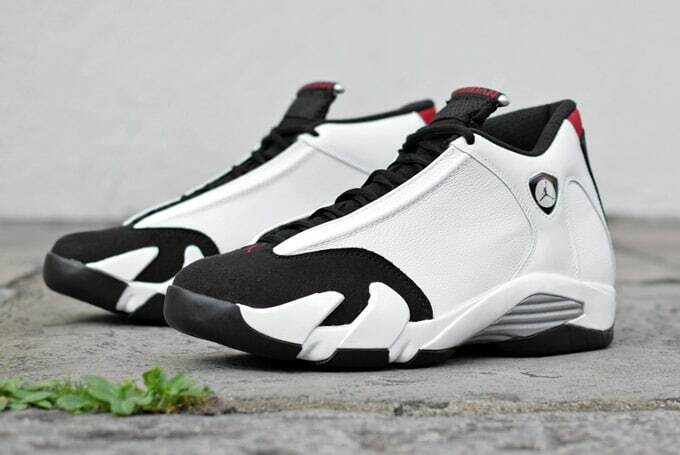 This one is undeniably significant for its role in the close of Jordan’s Bulls career and the sequel to this instalment, the bizarre (but kind of brilliant) XV, made the 14 look normal by comparison — a black toe on a Jordan is something that harks all the way back to the first ever Air Jordan and this shoe, with its Ferrari 550 Maranello inspired looks, proved pretty influential. Automobiles would also be key to Aaron Cooper’s Pippen II creation for Jordan’s partner on the court around the same time, with concept car ideas being a late 1990s and early 2000s mainstay until somebody seemed to realise that the weirdness was becoming a hard sell. We prefer the smoother upper, rather than the stitched, perforated and ridged XIV on the ‘Candy Cane’ editions — it makes the design flow a little better, even if breathability might be lessened. Weirdly, this ‘Black Toe’ got that perforated upper in recent reissues, making this the first time we’ve seen this one looking like it should do post-1999. MJ never wore these in a game, but they made it to his feet during training and some other appearances. Plus, that colour block really highlights the strange, grasping, supportive sole detail on this performance classic. One of the last of the Jordan era in its truest form — these will be online this Saturday and probably won’t disappoint the 14’s faithful, even if the quality never seems to reach the OG heights.